Henry Dagmil first came to national prominence at the 2004 Philippine National Open. The Mapua Institute of Technology alumnus, then 22 years old, eclipsed the long-standing record of 1936 Berlin Olympian Nino Ramirez. Dagmil flew to a distance of 7.83m in the long jump, beating the 68-year old record by 18 centimeters. Since that definitive moment, Dagmil has been the Philippines top male long jumper, complementing Marestella Torres’ sterling record in the women’s event. He has competed at the world’s highest stage, representing the country at the Berlin and Daegu World Championships and at the Beijing Olympics. Dagmil has amassed an impressive collection of regional-level medals. 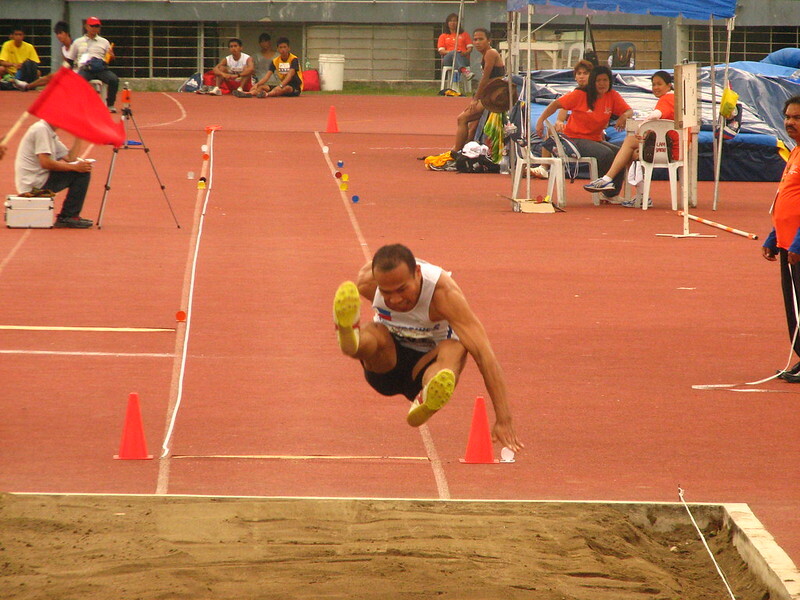 In an international career spanning almost one decade, the Filipino champion had won two Southeast Asian Games long jump titles (2005, 2007), on top of silver (2011) and bronze (2009) medals. In front of hometown fans at the 2005 Manila SEA Games, Dagmil teamed up with the 100m/200m national record holder Ralph Soguilon, Arnold Villarube and Albert Salcedo, to win a 4x100m relay silver, setting a new national mark in the process. The two-time SEA Games long jump champion has a lifetime’s best of 7.99m from 2008. However, the eight meter barrier – the mark of a truly world-class long jumper – has continued to elude Dagmil by the smallest of margins. Now 31-years old, Dagmil has until the 8th of July to go beyond the 8.10m Olympic “B” standard – and secure a ticket to London. 1.) How did you get started with athletics? [In] Grade4, I started [competing in the] 50m and long jump. I was 10 years old. 2.) What’s the most memorable moment of your athletics career? The most memorable is [when] I represented [the Philippines at the] Olympic Games. 3.) What is your life long dream? To be successful in life, jump [beyond the] eight-meter barrier. And to be a national coach [who can] produce a world class athlete. 4.) Let’s lighten up a bit! What would you rather wear and why? Short shorts or tights? I like Mizuno. [It looks] good on me. I prefer tights. 5.) What is your favorite sports movie? Sports movie? Yung mga nagbibigay inpirasyon. Kahit anong movie basta maluluha ako. hehehe [I like inspiring movies. Any kind of film that makes me cry]. 6.) What’s the best pump-up song of all-time? Kahit anong song basta inspiring [Any song. As long as it’s inspiring]. 7.) If you could spend the rest of your days at any place in the world, which place would you choose? I’ll spend my time with [my] wife and my kids, because I’ve spent [half of my life] on my athletic career. 8.) What do you do in your free time? Rest, sleep, watch a movie, call my wife [and] my son on the phone, [and surfing the] net. 10.) What advice would you give to the young athletes of today? I want them [to] dream. Ask the Lord’s [help], to be patient and willing to sacrifice [a] normal life to become an Olympian. [Not to] be a fool even [if] you [achieve the dream of being an] Olympian. I’ve been reading about the Philippine athletics results in the ongoing 26th Southeast Asian Games in Indonesia. To date, Filipinos have won only two gold medals, courtesy of Marestella Torres (Gold, Women’s Long Jump) and Rene Herrera (Gold, Men’s 3,000m Steeplechase). Other defending champions did not fare as well as Torres and Herrera, with the likes of Arniel Ferrera (Silver, Hammer Throw), Rosie Villarito (Silver, Javelin Throw) and Henry Dagmil, To the casual observer, the initial reaction would be one of disappointment. After all, two gold medals is way off the target of six set by the NSA president, Mr. Go Teng Kok. Come to think of it, we’ve been relying on these marquee names for the past decade. Most of our top athletes are in their thirties. The sport demands much from one’s body. Hence, it is unsurprising to see the likes of former champions win silver medals, instead of golds. Considering the fact that athletics in the Philippines is a fringe sport, our sporting heroes should be lauded. Aside from lucrative, mainstream sports, being a Filipino athlete isn’t exactly the most lucrative of careers. Despite missing the fighting target, it’s good to see young turks like Melvin Guarte and Archand Bagsit excelling in regional competition. The 20-year old Bagsit snatched the silver medal in the 400m dash, thanks to a blistering finish, on top of his 4x400m relay silver. Guarte, still a junior, won silver medals in the 800m and 1500m runs, setting national senior and junior records in the former. Regardless of how disorganized our local athletics scene is, the exploits of our young athletes speak volumes about the enormous potential of Philippine track & field. Should the ills of athletics and Philippine sports be miraculously cured, expect the Filipino athlete excel not just in the Southeast Asian Games, but also in the world stage. Darya Klishina Дарья Клишина with the Filipino jumpers! The Philippines’ top long jumper, Henry Dagmil, posted photos of him and Marestella Torres with none other than Darya KlishinaДарья Клишина ! Salamat sa litrato, Kuya Dags! The Daegu World Athletics Championships is just around the corner. South Korea will play host to the most prestigious gathering track & field athletes after the Olympic Games, the third time for an Asian country to do so. Sprinter Usain Bolt, in light of his spectacular array of world records, is the undeniable front-act. Other crowd drawers are triple jumper Teddy Tamgho of France (a stress fracture prematurely ended Tamgho’s season, unfortunately), high jumper Blanka Vlasic and javelin thrower Andreas Thorkildsen of Norway. The Kenyan 800m runner David Rudisha, fresh from a slew of world records last season, is on the hunt to rewrite the two-lap mark once more. The sprints, as always, will provide fast-paced action as the rest of the world pits their sprinting might against the dominant Jamaicans and Americans. The Philippine Amateur Track & Field Association (PATAFA), one of the country’s best-performing NSA’s sent a crack team of Southeast Asian Games champions in the likes of hammer thrower Arniel Ferrera, steeplechaser Rene Herrera and distance runner Eduardo Buenavista. Henry Dagmil, a near 8.00-meter long jumper, and javelin throwers Danilo Fresnido and Rosie Villarito, also competed. The Philippines sent its best athletes, led by 2010 Asian long jump champion Marestella Torres, to the Guangzhou Asiad, only to come home empty-handed. The Philippine athletics medal drought continues, with the country’s best hope, Torres, losing the bronze medal on count back. Aside from Torres, the closest to the medal standings was Dagmil at 6th place with his 7.45m leap. The Men’s long jump was won by South Korea’s Kim Deok-hyeon’s (김덕현). The Olympic and World Championships veteran was far from his lifetime best of 7.99m and his season’s best of 7.77m. SEA Games hammer throw record-holder Arniel Ferrera placed 9th (58.06m). Tajikistan’s Dilshod Nazarov topped the field with his 76.44m heave. Likewise, Herrera finished 13th in the 3,000m steeplechase despite stopping the clock at season’s best of 9:02.93. The event was won by Tareq Mubarak Taher (8:25.89), a Kenyan-born Bahraini. The ageless Danilo Fresnido threw the javelin to 70.35m, good enough for 10th. Japan’s 2009 World Championship bronze medalist Yukifumi Murakami 村上 幸史 dominated the competition with his 83.15m mark. On the distaff side, Rosie Villarito (48.87m) finished second to the last at the women’s javelin throw competition. Japan scored a golden double in the javelin with Ebihira Yuki’s winning heave of 61.56 m.
Buenavista, the country’s long-time distance running ace, ran a puzzling if not utterly shocking race in the Men’s marathon (2:45.07), a far cry from his national record of 2:18.44. According to a report by the Manila Standard, Buenavista will be facing a PATAFA inquiry on his Asiad performance. (As an athlete myself – and a huge admirer of Vertek – I do not want to judge. Let us hear it from the man himself. For all we know, he could have been nursing an injury. Let us keep in mind that Vertek has competed with distinction for Flag and Country in countless other meets). SEA Games success does not automatically translate into Asian Games success. Save for Torres and Dagmil, the level of competition in the Asiad was simply too much for our best track & field athletes. The government and the private sector did not spend millions on our track & field athletes, unlike the Smart Gilas Basketball team which finished 6th overall Filipino track athletes, like most Filipino athletes not playing in the PBA or not named Manny Pacquiao, are marginalized. Our lone IAAF-accredited stadium is currently under renovation with much controversy. Even if Torres and Dagmil had training and competition stints abroad, our domestic jumping facilities pale in comparison with our Asian neighbors. The rest of the Asiad athletics campaigners aren’t as well-supported like Torres and Dagmil. Indeed, you reap what you sow. With their circumstances in mind, I cannot in all honesty lay the blame on our athletes alone. In fact, I’m welling up with much admiration for those eight brave souls – to go against Asia’s best for one’s motherland is an honor accorded to so few! But then again, the words of POC’s Romasanta (a former Gintong Alay official) sounds promising. He emphasized focus on medal rich sports like gymnastics, swimming and athletics. I am not lambasting the well-meaning support of Smart for the country’s national basketball program since like most Filipinos, I’m a basketball fanatic as well. I’m just hoping that some kind corporate entity back an honest-to-goodness athletics program, similar to golf’ and shooting’s respective grassroots development schemes. I’m a firm believer that a million pesos spent in the course of an athlete’s years-long preparation is money well-spent than a million peso reward given after winning a SEA Games, Asian Games or Olympic Gold. Ace Filipina long jumper, Marestella Torres, narrowly missed landing a podium finish at the 2010 Guangzhou Asian Games. Torres made only one legal jump (her first round attempt of 6.49m), which was good enough for 4th place. The Filipino national record holder at 6.68m lost to the Ukzbekistani Heptathlon Champion, Yuliya Tarasova, on countback. South Korea’s Jung Soon-Ok 정순옥 won top honors with her modest 6.53m leap. The 2010 World Indoor Champion in the Triple Jump, Olga Rypakova, grabbed the silver (6.50m). Torres was tantalizingly close to becoming the first-ever Filipino track & field athlete to win an Asian Games medal since the legendary Elma Muros-Posadas’ long jump bronze in the 1994 Hiroshima Games. In fact, the powerfully-built long jumper held the lead for the first two rounds, before Rypakova (the Asian triple jump record holder at 15.25m!) bettered Torres’ leap by 1 cm. Torres is a three-time SEA Games long jump champion and the surprise winner in last year’s Asian Athletics Championships. According to a Manila Bulletin article, Torres twisted her ankle in the 2nd round. With Torres’ heartbreaking 4th place finish, the last Filipino hope for an athletics medal is long jumper Henry Dagmil. The long jump is an unpredictable event. In the event where the word “Beamonesque” was coined, anything can happen. Unless you’re a Carl Lewis, rock-hard consistency is hard to come by. The competition could have gone both ways. Had Maris made a legal jump in one of those failed attempts, she could have won gold! A 4th place finish is a respectable result nonetheless. We’re proud of you Maris! Your time will come! Since it’s Asian Games time again, I couldn’t help but watch Liu Xiang’s 刘翔 gold medal-winning performances in Busan and Doha. The 2002 Busan race was memorable. I was just starting out with the sport. I became an instant Liu Xiang fan once I saw him race! I even recorded the event on VHS; hence the grainy format. Satoru Tanigawa of Japan was a far second, almost six hundredths of a second behind the then 19-year Liu Xiang. 18-year old Shi Dong Peng 史冬鹏 – the other half of the high hurdling Chinese duo – dropped out of contention for the medals after he clipped a hurdle. 2002 was the year Liu Xiang broke Renaldo Nehemiah’s world junior record, when the latter stopped the clock at 13.12s (over senior hurdles, not the junior ones!) 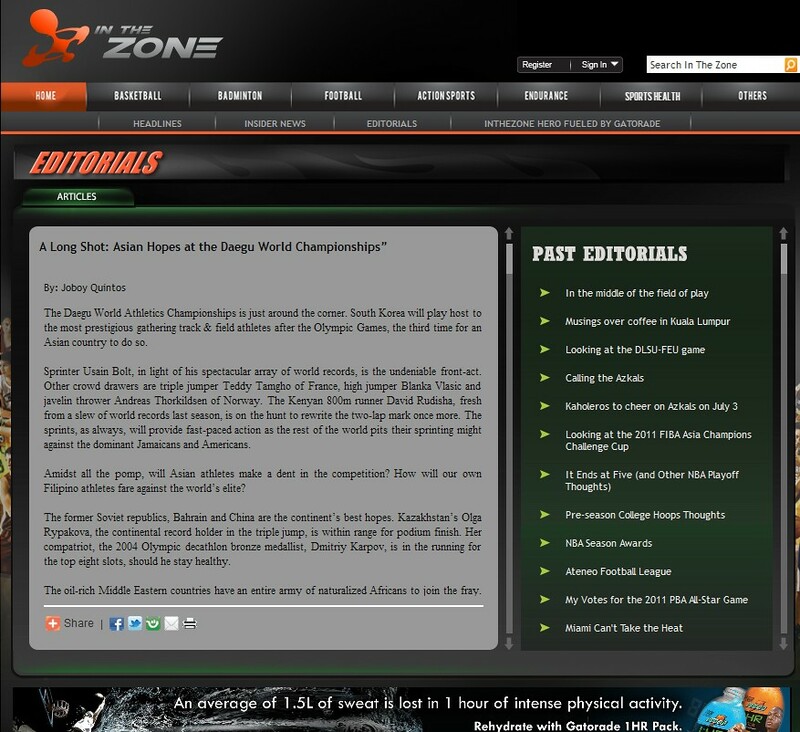 in Lausanne, Switzerland.Fast-forward four years later in the Doha edition of the Asiad. Liu Xiang is now a household name in China, with world championship bronze and silver medals, an Olympic gold and a world record (12.88s, also set in Lausanne) to his name. Liu was a monster in the race. He was a lot quicker in between hurdles; his technical proficiency was at a different level. Liu was the epitome of the complete sprint hurdler. Now 23-year old, Liu was approaching the peak of his physical fitness. The winning margin was not as glaring as in 2002, since Shi Dong Peng is a decent hurdler in his own right. Liu clocked 13.15s as he practically jogged to the tape once the victory was his. Big Shi ran a respectable 13.28s, one-hundredths of a second off Liu’s winning time four years ago. Comparing the results of the two editions, one can see the dramatic increase in the level of competition. If the 2002 silver medalist, Tanigawa (13.83s) ran in Doha, he would have placed a dismal fifth! Perhaps the improvement in the quality of performances can be attributed to Liu Xiang’s rise to the top – and the subsequent emergence of the sprint hurdles as the centerpiece event in Asian athletics.Under much criticism, Liu was given a “free pass” to the Guangzhou Asian Games. The 2004 Olympic Champion was allowed to miss the national championships, in light of his recovery from his troublesome Achilles. I personally believe that an athlete of Liu’s stature should be given this special treatment. It’s not like he doesn’t deserve the extra lee-way. Despite all the challenges, I wish the best for my idol! 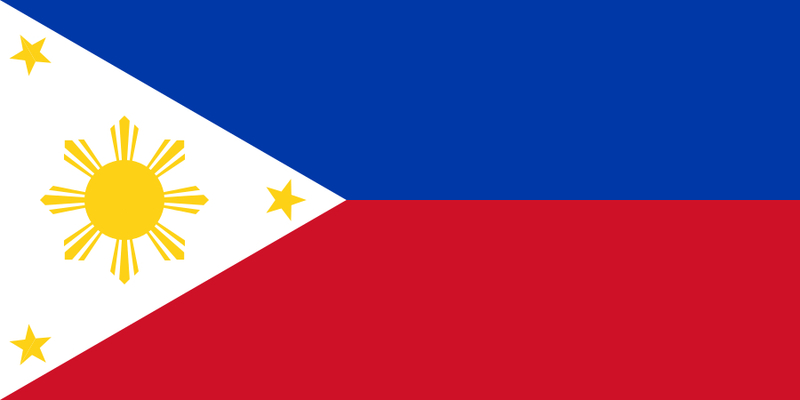 Also, godspeed to all the Filipino athletes competing in the 2011 Asiad, especially the tracksters – Arniel Ferrera (Hammer Throw), Mariz Torres (Long Jump), Henry Dagmil (Long Jump), Rosie Villarito (Javelin Throw), Danilo Fresnido (Javelin Throw), Rene Herrera (Steeplechase) and Eduardo Buenavista (Marathon). One of my favorite world records is Roman Sebrle’s 9,026 points in the Decathlon. Sebrle is the only man ever to have gone above the 9,000 point barrier in the grueling 10-discipline, 2-day event. His countryman Tomas Dvorak (8,994), Dan O’Brien (8,891) and the legendary Daley Thompson (8,847) went tantalizingly close to breaking the barrier, but only the indefatigable Roman Sebrle himself was able to achieve this momentous milestone. I’ve always admired and envied the multi-events. Admired – since they had to learn 10 disciplines, contributing to a holistic experience of the sport. Envied – because among all the events in athletics, the decathlon is without a doubt the most grueling and draining. Decathletes (and heptathletes) are “the world’s greatest athletes,” as King Gustav V of Sweden told the 1912 Olympic Champion, Jim Thorpe. The elite level decathletes (and heptathletes) are the most impressive of all, needless to say. With their mastery of the 10 disciplines (or 7), the best times of a particular world-class decathlete can rival or even exceed the respective, individual national records of a small country like the Philippines. In Sebrle’s mythical 9,026 point performance, his 8.11m leap in the long jump and his 13.92s time in the 110m high hurdles are better than the current Philippine records of 7.99m (Henry Dagmil) and 14.76s (Alonzo Jardin), respectively. In terms of overall personal bests, Sebrle’s best clearance of 5.20m in the Pole Vault exceeds Edward Lasquette’s 5.00m vault. Likewise, the Czech’s farthest throw in the shot put, 16.47m, is better than Bruce Ventura’s 15.83m Philippine record. Naturally, the Philippines’ best decathlete, my former coach Fidel Gallenero (6,963), was light years away from the standards of Sebrle. If for some far-fetched reason, Sebrle switched allegiance to the Philippine flag at his prime, he could have set at least 5 national records in one decathlon! Sebrle is without a doubt a legend in athletics. Even at 35 years old, Sebrle is far from retired, having competed at the 2010 Doha World Indoor Championships. Being the elder statesman of the sport and his event, Sebrle is a role model for track athletes of all ages and ability. And he can belch out a mean song number too, endearing the 2004 Olympic Champion to this karaoke aficionado! Track & field is an individual sport. There is some measure of teamwork in the distance events, where packs of runners can stay together throughout the entire race (like Flying Finns of the olden days) or follow a designated pace maker for particular stretches. But in the end, an athlete’s result for a particular event is credited only to the effort of one. The team aspect of the relays sets it aside from the other disciplines. Passing the baton from one sprinter to the other makes for an exciting spectacle. The speed involved makes little room for error, where the slightest mistake in timing and release could spell the difference between triumph and defeat. Perhaps that is why the relays are traditionally held at the latter parts of an athletics competition. It is a fitting finale to the showcase of speed, strength and endurance that is track & field. It is in the explosive 4x100m relay where an underrated quartet can overcome a faster set of opponents through slick passing. Unlike its longer counterpart, the 4x400m relay, the underdog squad can overcome glaring differences in aggregate speed at the shorter race. Whereas in the longer relay, the most dominant force in the quarter-mile, the Americans, almost always reign supreme. My favorite relay race of all is the 2008 Beijing Olympics 4x100m relay, where the indefatigable Nobuharo Asahara anchored the Japanese team to an unprecedented bronze (38.15s). Japan has always been a consistent qualifier to the 400m relay finals (4th – 2004, 6th – 2000, 6th – 1992, 5th – 1932); it was about time the Japanese won something big on the Olympic athletics stage. This proves that Asians, with the proper combination of fortunate circumstances and great teamwork, can distinguish themselves in the elite sprinting ranks. And yeah, need I say more about the Usain Bolt-led Jamaican relay world record? On paper, the Japanese squad was the favorite. However, an underrated Thai team overcame the stark differences in aggregate speed with their flawless baton exchanges. The formidable American quartet of Shawn Crawford (9.88 – 2004), Justin Gatlin (9.85s – 2004), Coby Miller (9.98s – 2002) and Maurice Greene (9.79s – 1999) lost to the British by a hair’s breadth, thanks to the former’s faulty baton passing – a fixture in American relay races. On paper, the Brits were a lot slower than the Americans. With a generous splattering of Olympic gold medalists and former/current/future century dash record holders in the American lineup, the gold medal was theirs to lose. And they lost it by the infinitesimal of margins, with Lewis-Francis edging out the fast-finishing Greene, 38.07s to 38.08s. Among the aforesaid underdog feats, the most impressive (Asian bias aside!) in terms of performance, glamor and glitter would have to be the Great Britain’s 2004 upset win. Whereas the 2008 Japanese relay quartet won bronze with both the American and British teams disqualified prior to the final, the 2004 British quartet overcame a loaded U.S. squad composed of 3 Olympic gold medalists and marquee names in sprinting. A decent enough aggregate speed and slick baton passing is imperative for a world-beating relay team. Although the traditional sprinting powerhouse, the United States, is well-endowed with prolific sprinters, baton passing has been an eternal thorn since American sprinters are a diverse group of athletes, spread among a vast country. As Shawn Crawford said during an interview, practicing baton exchanges becomes a difficult in light of the varying schedules and locales. A much smaller country like Britain, Japan and Thailand could muster more frequent training sessions. From what I’ve heard, the Thailand team practically lived together as a team. The Japanese team, similarly, are a tightly bonded lot, as exhibited by the emotional farewell they gave to their long-time ace sprinter, Asahara. The current Philippine national record stands at 40.55s, set during the 2005 Manila Southeast Asian Games where Philippine 100m/200m dash record holder Ralph Soguilon (10.45s), Albert Salcedo, Long Jump record holder Henry Dagmil and decathlete Arnold Villarube won silver. If the Philippines can assemble a formidable array of mid- to low-10 second sprinters and perfect the baton exchange, surely, a sub-40 clocking is a possibility.